BetFred is named after Fred Done who built the business along with his brother Peter from a single shop in Salford in 1967. The firm now has over 1300 high street shops, 10,000 employees and a turnover of around £1.6 billion. BetFred is owned by Gibraltar based company Petfre who are committed to maintaining the core values of Fred Done and the BetFred brand. BetFred is also proud to be UK horse racing’s biggest sponsor. BetFred simplified the welcome offer. They are now offering “bet £10, get £30”. The terms and conditions are absolutely easy. Just pick odds even or higher on any sports market and you will get £30 if you bet £10. This promotion is only available for UK customers. BetFred is known as “The Bonus King” for their impressive range of bet refunds and enhanced pay-outs across a vast array of sports. There is a “Promotions” link on the main page that takes you to all of the current offers. These include double odds on some half-time betting, Double Delight & Hat-trick Heaven and muss more promotions. The most buzz came from their new ACCAttacka mobile functionality. Pick the amount you would like to win and the your staking and the App will find you interesting odds that would fulfil your requirements. In keeping with most of their rivals, BetFred offer “Best Odds Guaranteed” on all UK and Irish horse racing. Take an early price with BetFred and, if the SP return is bigger, they will still pay out at the better odds! No surprise here, since Betfred is also the owner of Totebet. BetFred also have a Super Bonus Offer on selected races for all correct Lucky 15/31/63, Yankee, Canadian or Heinz bet. The races are listed as Super Bonus Races on the web site. There are also consolation offers on one winner in multiple bets and refunds on runner-up in selected races. If you correctly select the first goal scorer and he goes on to score a second goal, BetFred will double your price! If that player then completes a hat-trick, BetFred will pay three times your original price! BetFred also have introduced a Special “1-A-Piece offer” whereby they will refund your stakes on any correct score bets on a Live TV match that ends 1-1! This applies on all correct score bets up to a maximum stake of £50. Beside this, the betting offer on Betfred.com really improved over the last few years. From a retail bookie to a modern online bookmaker is a very tough development, but Betfred seems to be able to handle this pressure. Don’t expect every small league like with Ladbrokes or Bet365, but you will surely find everything interesting and important, including a lot of the minor leagues as well. The inplay offer is a betsream product and therefor very solid, but again, this is not a “top3-bookie”-offer. BetFred’s football coverage extends all English and Scottish leagues plus the top European leagues and International fixtures. BetFred provides strong Asian Handicap betting odds as well as very competitive win-draw-win betting prices. BetFred concentrates largely on Football, Horse Racing, Darts, Snooker and Greyhounds but are by no means limited to these sports. They will be happy to accommodate you on boxing, baseball, American football, rugby, tennis and Athletics. They also cover a number of non-sporting events including the TV Shows like Big Brother and Sports Personality of the Year as well as major political events such as the American Presidential Election and the UK General Elections. Overall we see a very UK focused offer to satisfy the regular UK-punter, but nothing going over the top. The BetFred website follows the traditional layout with a drop-down sports menu on the left-hand side of the page. This is split into two sections for “Betting Highlights” and “Sports Betting”. 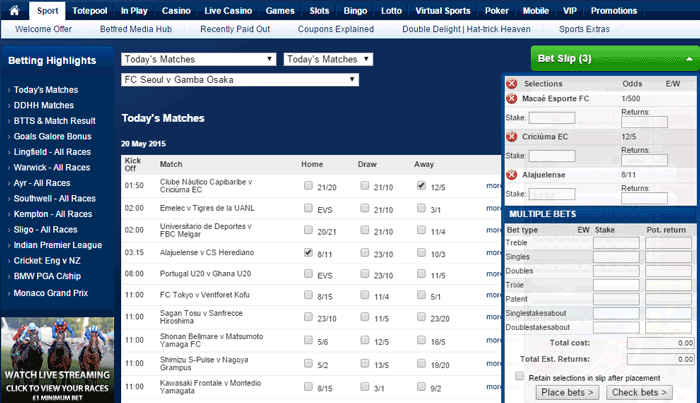 The Betting Highlights section features up-coming matches and popular bets and is intended to speed up your search. The main panel is the “Bet In Play” markets covering a wide range of sports. You can quickly locate the day’s racing through any of these methods and your bet slip will appear in its usual place on the top right-hand corner. Placing your bet is fast and simple but you need to click on the racecards to see more detailed form and analysis. You will have access to the regular features including form and statistics plus selected video replays. There is also a nifty race predictor with the emphasis placed on the winning form of each horse. A news link will keep you right up-to-date as well as bringing you all the latest results and market movers. The football coverage is equally expansive with drop-down menus for all of the top leagues, up-coming and televised matches. There is a quick link in the Betting Highlights panel to bring you the latest Football and Racing Offers. 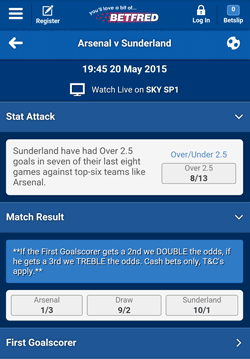 There is a quick link to BetFred Mobile with all the regular features of the main site and latest promotions. To access BetFred’s mobile betting service, just type betfred.com into the browser on your phone. We really liked the very clean look of the app, but Betfred should do some homework to eliminate the need of very deep-clicking through a lot of sub-menus. Otherwise the frustration might come too early. BetFred provides 24/7 customer support through Freephone, Live Help or email. There is also an extensive FAQ section to help you with any minor issues. BetFred are working hard to retain their reputation as “The Bonus King” with a fine range of special offers and promotions. The Double Bonus welcome gets you away to a great start and BetFred’s approach is to make your betting enjoyable and entertaining. The site is not the easiest on the eye as it can get a little too busy but they do have a lot of promotions to present! Once you have become accustomed to the site, it is a breeze to navigate and makes things fast and simple for placing your bets. BetFred is a safe, secure UK bookmaker which goes out of its way to provide good value. Definitely a worthwhile addition to your betting armoury!